Who’s That Pokémon? 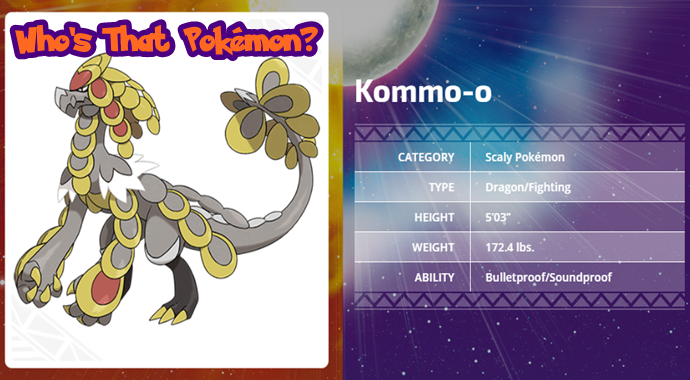 It’s Kommo-o! Welcome back to Who’s That Pokémon? the feature series regarding the Pokémon we can expect to see in the upcoming games. From Rowlet to Tapu Koko, and Drampa to Ash-Greninja, we have covered them all, but now we have another eight Pokémon to cover, so get ready for another instalment of Who’s That Pokémon? We dedicate this edition to Hakamo-o’s evolved form, Kommo-o! Description: “At the end of its harsh training, Hakamo-o evolves into this overwhelmingly powerful form. It returns to the land of its birth, where it watches over the Jangmo-o from a distance. Tags: Gen 7, Jangmo-o, Kommo-o, Pokemon, Pokemon Moon, Pokemon Sun, Who's That Pokémon?